First off, in case anyone is confused, this book is by MATT Berman, George Magazine's art director -- not by MICHAEL Berman, who was JFK Jr's business partner at the magazine. I plowed through nearly a quarter of the book before I realized which Berman had written it. That said, it's an affectionate remembrance of the former President's son who died tragically when the private plane he was piloting disappeared in the dark night. Prior to joining George, Matt Berman had worked at Elle. Swept into the spotlight, he was befriended by JFK Jr. The story recounts some of the magazine's most memorable cover photo shoots but mostly offers affectionate anecdotes of the author's growing friendship with JFK Jr. and Carolyn Bessette. Although JFK Jr. was world-famous through no effort of his own, in Berman's eyes he was a great man with natural charm that put people at ease thanks to his warmth, humor, and charisma. He had a habit of picking out the most uncomfortable person in a room and chatting them up to make them comfortable.The book is a quick read, but aside from magazine nerds and remaining JFK Jr. groupies, I'm not sure it will be of broad interest. JFK Jr, George and Me is a thoroughly enjoyable recounting of the author's experience working as the Creative Director of George Magazine. But there is more depth to it than the title implies. This is the story of a young man's journey, from a boyhood traumatized by an accident resulting in substantial facial scars, into the world of art, beauty and design. Obviously naturally gifted, Matt Berman's desk doodling evolved to weekly art classes and his recounting of those childhood years spent with a memorable cast of characters is often comical. Landing in NYC after an education at Carnegie Mellon and Parsons School of Design the author begins work as a graphic designer for Elle Magazine and later for George. There is quite a bit of name-dropping of people and place, but that is to be expected given the subject matter. As it relates to the late JFK Jr, the author's observations and memories are refreshingly candid and genuine. A fairly quick and fun read. So far I find this book incredibly interesting and don't understand some of the harsh reviews. It is not intended to be a comprehensive bio of JFK Jr. It is simply a very small window into one aspect of his life - his venture with George magazine. The author got to know him through their work on George. Unique perspective and not salacious at all. If you are interested in the Kennedys or JFK Jr., definitely worth the read. Quick, easy read. Everything Ive read about JFK Jr says what a nice guy he was...this book basically reaffirms this fact. A great guy taken too soon, the story told by someone who really liked & respected him. It was interesting to read about the cover shoots & some of the history of the magazine too. This is the second memoir I've read regarding JFK Jr., the first being Fairytale Interrupted.Like Fairytale this memoir was punctuated with stories that highlighted what a great guy and amazing friend JFK Jr. was. It was inevitable that I'd read this book, no doubt at all, but it wasn't inevitable that I'd like it. I have been super critical lately and I was fully prepared to dislike this guy. I was fully prepared to come away thinking the author was trading on his chance meeting/working with JFK Jr. and that was not at all what this book was about. He definitely was aware that his working relationship/friendship was fortunate and freely admitted it but the book was more about working at the magazine and that part was fascinating.I loved George magazine. I have always bought more magazines than I needed and this one was always calling out to me from the newsstands. Having the opportunity to go behind-the-scenes through this book and learn about how some of their epic covers were created is just a treat. Matt Berman was the art director and the stories he tells about what it was like to battle it out and get things done in the publishing industry was a page turner for me. There was content in there about JFK Jr. and his wife but only in how it related to the magazine and his friendship with them. The title gives you a true picture of the balance of the contents of the book.I think that this book would be of interest to people who are fascinated by the Kennedy family; certainly so. More so I think it would be a treat of a book for anyone who likes when the curtain is pulled back and you get to see the nitty gritty. This book has great nitty gritty details about photo shoots and getting celebrities like Robert DeNiro to wear a wig. It's not particularly well written but that is part of it's charm. It's a memoir written by an art director and it reads like one. It is a book worth reading and it will transport you back in time. To a wonderful time when a once-in-lifetime magazine was published. I miss it. Loved this book. Anyone who wants to know about the great wonderful kind person that John F Kennedy Jr and his lovely wife Carolyn was should read this book. The book is written by the former creative director of John's debut magazine George, Matt Berman. He worked for five years with John developing and creating each issue of the magazine that is 'not politics as usual'. The author shares great stories and past memories and by the end you will have felt you worked in the offices of George.Even today so many years after John and Carolyn's tragic death with her sister Lauren we still don't know much about John and Carolyn they still remain a mystery. It's hard today to cut through fact and fiction as many people have wrote lies about them just so they could earn money with a book about the famous couple. This book gives an honest loving look not only about the couple but inside the world of the magazine and the authors friendship with John. It's a great book that I would recommend to anyone who loves John F Kennedy Jr and his wife Carolyn Kennedy and would like to know more about them (be aware though: this book is more about the magazine George (hence the title "JFK Jr., George & Me") then it is about John F Kennedy Jr, so don't expect a full on biography about him or his wife or there life as a couple). It's a funny heartfelt book that will make you happy and sad and you will be laughing and crying at the same time. Wonderful book that is a quick easy read about the crazy world of George magazine and the man who was suppose to do everything except open a magazine and the man who ran his creative department and the fun loving friendship that came out it. This was a tiny little peek into the world of JFK Jr. I did read the George magazine, and did so because of John Jr. and the intriguing covers! The book started slow, only because I wanted to hurry up and get to the John part. But after reading the book thought differently. Matt did a good job of telling his side of the George magazine story. Who knew so much went into creating a cover? The celebrity stories were fun. And the French magazine stories were quite interesting. The movie The Devil Wears Prada was pretty much true. Even for men.John Jr. was as nice and kind, etc….better than I had hoped. He even argued in a good way. Matt told of how John dealt with photographers and how he avoided them, his manners and a few not so good ones. Matt was also interesting, he had a traumatic incident as a baby that truly left scars. I think I read between the lines and felt Matt was quite the sensitive and probably moody soul, as most creative artistic people are. Working with John Jr. was probably the best thing for him, helping him to relax and get out of his comfort zone. I found myself holding my breath as I got towards the end. The feeling you get as you re-watch a movie and know the ending, always hoping maybe this time it will be a happy ever after. I remember that day and the disbelief. I wished the book was longer. I wanted more George magazine stories. It was a fun, quick and sentimental read. It was really about JFK Jr. last of the three topics, which was good because I could tell that the author and John Kennedy Jr. mostly knew each other from work settings. The author comes off as snobby, but he is a great storyteller who genuinely cares about demonstrating that his buddy was a real person.The final thoughts on JFK Jr. made me cry with emotion and leave the book store to let the closing thoughts sink in. The final thoughts made me care more deeply about how the media has mistreated John Kennedy Jr. during his lifetime.I was never a groupie to JFK Jr., but I was a fan of how he tried to make politics more accessible to the layperson with his magazine. That made this book interesting to me personally because I liked seeing inside the creative process from its groundbreaking artistic director. (Although George magazine did not have especially groundbreaking reporting in my opinion).To me, John Kennedy Jr. was just an heir who admirably tried to break the high society mold by trying to make politics accessible to the layperson. Which is more than can be typically said of American aristocratic types or American news media types. That made this book especially interesting to me. I am not sure if a book like this can have broad appeal beyond New York or LA "Society" type people or news junkies. I thoroughly enjoyed this delightful book. As Creative Director of JFK, Jr.'s George Magazine, Matt Berman had the most wonderful opportunity. He not only was responsible for the magazine's iconic covers (think Barbara Streisand as Betsy Ross), but he had the unique chance to know and work with John F. Kennedy, Jr. Berman introduced us to a young man who grew up in the world spotlight, but was really unaffected by all the hoopla. JFK, Jr. was a great people person who genuinely liked most everyone. He treated each person the same--whether they were celebrities or just plain folks. He could laugh at himself, tease others and accept with a grin what others dished out to him. As I began the book, I thought how lucky Matt Berman was to count JFK, Jr. and his wife, Caroline, among his friends, but by the time I reached the last page, I realized it was JFK, Jr. who was lucky to have a friend like Matt Berman. This story is more about the author and his transformation from being insecure and lacking confidence to building his career as one of the go-to guys in publishing. His depiction of JFK JR is how I always pictured him in my head, so it's endearing to know that the genuineness that came through every time JFK JR did press or was at an event was truly who he was. John took great care of the people he loved. He knew how to help people shine, and Matt was one of the people he helped flourish. I think this book offers a great depiction of Carolyn as she was always depicted as cold to the media. However, Matt's depiction of her came off like he was in love with her. This was a very good read and I appreciated the depiction not only of Matt's relationship with John but also the inner workings of publishing a magazine. It was a little slow going at times, but definitely worth the read if you're a fan of behind the scenes type stories or a JFK JR fan. It's hard for me to write a review because Berman did what he called people out on in the last few pages - capitalized on his friendship and the death of JFK Jr.The Kennedys have always fascinated me. Though I was only in my early teens at the time he was being called the sexiest man alive, JFK Jr was the man I wanted to marry, my celebrity crush. I remember being devastated when he died, and hoped for so long that they'd all be found alive.I really wanted to like this book, but it felt forced and contrived. Did every conversation REALLY happen that way? Doubtful. How could anyone possibly remember that many insignificant, mundane conversations? 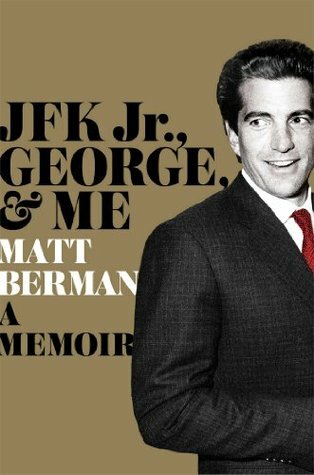 I was hoping for more about George and JFK Jr as the editor, but didn't expect such, as this is Berman's memoir and thus his life. It was a quick read, some interesting stories (especially about the photo shoots), but a little more of what the title promised would have been nice. This is a quintuple memoir of the author, John F. Kennedy Jr., George magazine, the end of an age of magazine publishing, and the 1990s. Matt Berman was a designer who John F. Kennedy, Jr. adroitly saw the talent in an hired him for his political / entertainment magazine project, in the era where they would fly to LA to photograph Barbra Streisand and work with photographers like Herb Ritts. John F. Kennedy Jr. sounded like the world's greatest colleague. It was interesting to see him combine the abilities and interests of both of his famous parents. For Berman this job and relationship was transformational in his confidence and life. If you are into magazines it doesn't disappoint there either. This book is short - not a lot to it at 200 pages. Written by Matt Berman, Creative Director of George magazine and friend to John. I loved George magazine, read it while I was in college. I think it mostly went over my head and I so wish it were around today - it really was a great idea and ahead of its time. Matt and John worked closely together and became good friends. This is a fun look into the magazine, the people who ran it, and John and his wife Carolyn. There seemed to be a happy couple - John was a very kind, funny, considerate boss. I enjoyed this book, Matt tells the story simply and easily. It makes me think what if John were still alive, where would he be? This was a quick read. It's more about the life of Matt Berman, who worked with John F Kennedy Jr., on "George" Magazine. Much of this book is about the various covers of the magazine, and how he thought up the ideas for these covers and then the actual cover shoot, with the celebrity that they had chosen, like Barbra Streisand and Cindy Crawford. For those almost 4 years, Matt said he worked closely with JFK Jr. and had nothing but praise for him I had subscribed to "George", and I still have a few of the magazines that he discusses in his book, in that way, it was an interesting read. Mr. Matt Berman did not need JFK jr. to make his life interesting, and I hope he writes another book about the rest of his life. Kennedy love is in my blood, and I won’t be ashamed. I don’t mean the watered down generation of Willie Smith Kennedy, though even they fascinate me. Such staying power. Berman speaks highly of JFK's wife Caroline, unlike William the friend from the Cape who wrote a similar memoir. Berman loves that JFK is such a regular guy. There is also the crazy environment of the magazine, including celebrity photo shoots. I was one of the initial subscribers to George Magazine. In fact, I think I still have a stack of them in my basement. It was fun learning about the genesis of the magazine from the perspective of an insider. The recap of cover shoot after cover shoot grew a bit tedious, but even most of those had their interesting anecdotes about the celebrities they shot. But what made this book the best was the inside it gave into the life of JFK Jr. It was a touching tribute about how he brought out the best in the author of this book. Interesting and funny stories about the working life at George magazine. Matt Berman, the creative director really admired JFK Jr and his wife Carolyn. It is nice to hear that and not the usual cutting people down to add interest to your book. The monthly magazine shoots featuring different celebrities were described and was entertaining. A little too much name dropping, like a didn't much care where Matt garbed a sandwich or the name of his favorite sweatshirt brand, but overall Matt comes across as a caring and decent guy who saw that his famous boss was similar. Library book. Read in 3 hours. Hated it. Hated the author. He's egocentric, self-aggrandizing and incredibly insecure at the same time...tries way too hard to show/prove he's cool. But really, he's only just brushed the coat tails of interesting people, which doesn't make him interesting too. He told me way too much about himself and nothing terribly "new" about JFK Jr. It had moments that might be interesting to people curious about magazine publishing, but sadly nothing was able to outweigh my dislike of him. An inside look at the working relationship between JFK, Jr. and his creative director at George magazine. JFK, Jr. is a kind, generous, funny and remarkably down to earth person. Obviously the book is bittersweet as his life and that of his wife, Carolyn and her sister Lauren's are tragically cut short as they fly in his plane to Martha's Vineyard. Learning more about John, Jr. as well as finding out which celebrities were difficult to work with (ahem, Barbra Streisand) and which were a pleasure (Drew Barrymore) was intriguing. I highly recommend this book, not as just another book about a famous person, which it is NOT... our library categorized on the spine as "Biography Kennedy"...the author, Matt Berman, gets short-changed here...it is right in the subtitle: "My Unlikely Friendship with JFK Jr"...this memoir is about him, and his professional and personal relationship with JFK Jr, as well as others he (Berman) worked with in his early career in publishing, then during the years on the magazine, "George"
I'm surprised the author held off so long in writing his version of being JFK, Jr.'s friend and co-worker. Not much new was added other than some amusing sections about working with the famous for the cover shoots of the magazine, George. I wonder if it's possible to achieve fame and not become so intertwined in your own self absorption you choke like some smothering snake? Someone should write a tell all about his wife. So far, they've been blessedly silent on the subject. Another trashy pick up from the library. The parts about working with the celebrities for the George cover shoots was really interesting - the Barbaras Streisand and Walters are ridiculous and well as you'd imagine in their high maintenance bubbles. But the rest of the book is little more than tittle tattle about JFK Jr, such is the fascination I guess still generates. So we get office ancedotes which are not terribly interesting. Erm, John gets a haircut. John cracks a joke. A nice quick sentimental read. It should be titled "George, JFK Jr. & me" as it focuses on Matt bermans time working at George magazine with JFK Jr. Only two things I didn't like. He kept referring to himself as John's Creative director when he was really George magazines creative director. And secondly toward the end of the book he complained about others capitalizing on Johns death umm isn't that what you are doing as well? Otherwise a good quick read. Read an excerpt in Vanity Fair and liked it enough to read the book. I was a JFK Jr fan and had a subscription to George. Matt Berman gives his perspective from inside the magazine world (before the rise of the internet)and recounts some great stories from the making of George and all the celebrity cover photo shoots. Along the way he includes stories about JFK Jr, without exploiting him. An enjoyable, quick read about the author's relationship with JFK Jr. I enjoyed reading about the making of the magazine as well as the background behind some of the covers. Not much new about JFK, yet it was a nice look into his every day life at work and the relationships he shared with his colleagues. Matt Berman was the art director of George magazine. According to this account George was his magazine and JFK, Jr. was a dabbler. Makes sense. But who wants to read a book about Matt Berman? JFK, Jr. kind of waltzes in and out of the narrative. It should have been titled "ME, George and JFK,Jr." Berman has a lovely writing style. I felt as though I was next to him as he remembered his time and relationship with JFK Jr. I don't know why the Kennedy's have always fascinated me, but I loved seeing the "real" side. I was a huge fan of George magazine so was very pleased to find this book. It was a glimpse into the behind the scenes happenings at a very interesting magazine. Matt Berman - Since the 1990s, creative director Matt Berman has been collaborating with some of the most influential photographers in fashion and art to create some of the industry’s most enduring imagery in print. In 1995, Matt was hired by JFK Jr. to serve as the creative director of George magazine. He wor­ked side-by-side with John until his death in 1999 to craft his boss’s unique vision for a new kind of magazine. Matt then moved to Paris and continued to serve as creative director on several French magazine titles and advertising campaigns. Presently, Matt is a creative director living in Los Angeles.